Author of bestsellers such as Be A Great Boss: One Year to Success and Renew Yourself: A Six-Step Plan for More Meaningful Work, Catherine Hakala-Ausperk should already be familiar to many readers. Her newest book though represents an even more focused, hands-on approach to library leadership. Here we discuss what makes her forthcoming series of planners stand out and she describes the concept of "future-proofing." 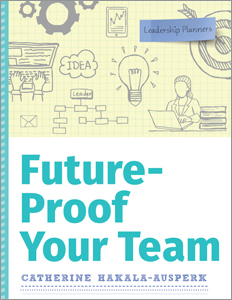 Future-Proof Your Team is the first book in the new Leadership Planners series. What’s the concept behind the series? Sometimes, at first glance, a leadership challenge can seem overwhelming. What I hope these planners will do is to help break these issues down in manageable and achievable pieces. These days, library staffs have shrunk and everyone is being asked to take on more and more. Leaders are no exception to this. What leaders especially need is a way to find the time to think things through and plan their actions. These planners are short on purpose. They're designed to help make the most progress in the shortest amount of time. As the introductions explain, when you've finished with the planner, you may not have solved your problem, but you will have a plan to do so. The thing about the future is, of course, it starts now, in the present. What are the first steps for someone who wants to step back and honestly assess the status quo? Leadership challenges most often involve people and, when people are involved, emotions can sometimes take over. The first step is to calmly, methodically, and accurately assess the situation. What has happened? What needs to happen? How can it be made to happen? More problems are solved piece by piece than by swift, often knee-jerk reactions. Can you offer some tips for those who are really motivated to take planning seriously but are having trouble carving out time in their schedule for it? I guess that's what I mean by plan to succeed. It's so very easy to get caught up in the stuff of day-to-day operations. Leaders frequently find themselves scrambling to do react to escalating issues. You said it best. We have to intentionally set aside time to plan to be successful as leaders. My first two books suggested getting in the habit of setting aside one hour each week to think and to plan. Whether you can do this by shutting your door or coming in early or staying late — or even by working from home, time to think is essential for those on whom others depend for solutions. What are some ways that a team leader can get everyone on board with this concept of future-proofing? The best way is to include everyone from the start. You should make sure your team knows you're working through the book! Squeeze 15 minutes out of every staff meeting to talk about the future and about dealing with change. "Let's plan how we can be successful in introducing our new computer system," would be a lot better than, "We're getting new computers next month!" Also, after you've been through a major change, take the time to debrief to see how you might have done better. Of course, if it went really well, then take the time to celebrate that, too! You end the book with a quote: “If the plan doesn’t work, change the plan but never the goal.” What are some clues that a particular plan might not be working, and how can a team leader adjust the plan without throwing things into disarray? Good leaders know their teams. They can tell when people are comfortable, confident, and motivated. On the other hand, they can also tell when they're not. Know your team. Talk to your team and, most importantly, listen to your team. That's the very best way to know if something is working or if it needs just a bit more planning to be successful. And, as far as avoiding disarray is concerned, the most important early part of a plan is accepting that some parts of it may not work and identifying — early on — how it can be adapted. What's the next book in the Leadership Planners series? 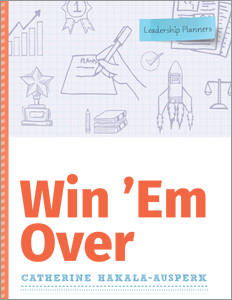 The second book is called Win 'Em Over and is for leaders who don't yet have the trust and confidence of their colleagues, their reports, or maybe even their supervisors. Maybe they don't have as many years of experience as those they supervise or maybe they've moved up the ladder in a non-traditional way. As I travel around the country speaking at Staff Days and Leadership Retreats, I consistently hear "They think I'm too young to be the boss." Perhaps a plan for building and growing confidence will help these leaders to win 'em over. All in all, there will be six Leadership Planners. The remaining titles are still in the works. Learn more at the ALA Store.